Nigeria international Ramon Azeez claims his dramatic winner against Real Betis on Sunday has put Almeria in a great position to stay in the Spanish top flight. Azeez's last-gasp goal gave 10-man Almeria a 3-2 home victory over relegated Betis to help pull his team out of the Spanish league's drop zone. The Super Eagle was left unmarked to head home Fernando Soriano's cross four minutes into injury time, to temporarily preserve his club's top-flight status. "We have two matches left and after what we did today I think we can survive." "There's no better feeling than scoring a late important goal," Azeez told BBC Sport. "I am extremely happy because a draw or defeat would have totally condemned us to the second division today. "We were practically staring at relegation. I could feel the tense atmosphere inside the stadium and that's the reason why some fans invaded the pitch. "It's just the first part in our fight to stay up. We have to travel to Granada next in our quest to stay up. With this victory today, it's looking positive. It was the midfielder's second goal of the season and both goals have come against Real Betis. Back in December, he scored the only goal in Almeria's away win there. Oscar Diaz opened the scoring for Almeria in the 52nd minute, but Betis fought back to take control with two goals from Braian Rodriguez in the 60th and Salva Sevilla ten minutes later. 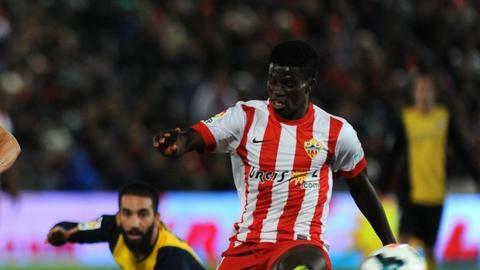 Vidal levelled for Almeria in the 77th before the late winner from Nigerian Ramon Azeez. "We had to keep fighting hard. The team gave a strong performance and we deserve the win," Azeez said. The Andalusia side, currently 16th in the 20-team table, travel to Granada on 11 May and seven days later they will host Athletic Bilbao on the final day.